23 May 2017 – Double UK Legends champion, Dean Brace, has set his sights on the MINI Challenge, entering for his first season alongside team manager Lawrence Davey. Competing in a JCW Class, Brace comes from a strong motorsports background, with three Legends Championship titles under his belt, along with prestigious Autosport Magazine award wins including the Golden Helmet award. Currenty 15th in the driver standings, Brace took a step back from racing in 2014, before being enticed back to the track under the wing of former Legends star and MINI Challenge race-winner, Lawrence Davey. 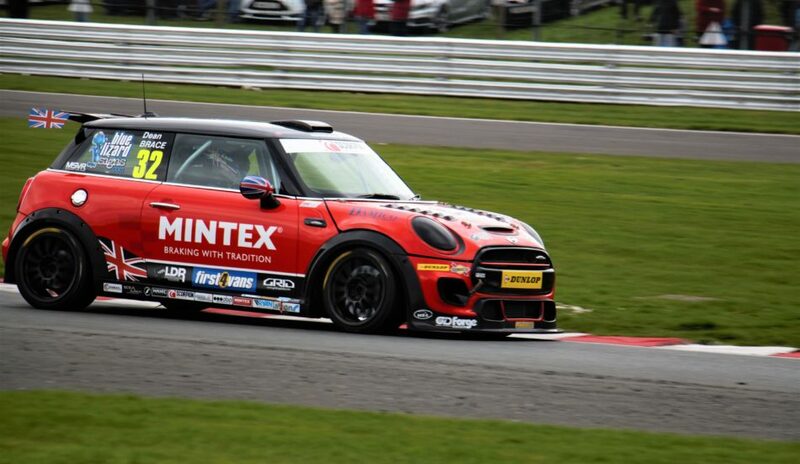 The Mini Challenge is now seen as a feeder into British Touring Cars (BTCC) and GT Racing with several teams and drivers involved in both events. Brace is sponsored by premium aftermarket brake brand, Mintex, which has also been chosen to brake all vehicles competing in the championship. This was as a result of rigorous testing of several brake brands to ensure the top performing brakes featured on all competing cars. Motorsport driver, Dean Brace, said: “Racing in the championship has been a great experience. As all the cars are on a level playing field, success really does come down to team set up and driver talent. The level of quality in the field, particularly this year, really shows how good the championship is and gives all the drivers that extra motivation to do well, adding to the excitement and the challenge. Brace’s next appearance will be at Snetterton on the 27th and 28th May. For more information on the MINI Challenge visit, www.minichallenge.co.uk.